3D Cellular's Advance TAS Audit System (ATAS) is a complete multi-vendor Configuration Management Solution for Telecom Application Servers (TAS). It was created for the #1 cellular network provider in the USA. The solution was required to automate the process of configuring, auditing and maintaining TAS network elements. Our solution provides a fully automated audit process, automatically generated configuration updates as well as an advanced user-interface to view TAS data and verify audit results. This solution is currently saving the customer substantial engineering time while ensuring perfectly accurate configuration. ATAS is in use with all supported TAS nodes in the customer network. ATAS currently supports TAS network elements from Ericsson, Nokia and BroadSoft. ATAS supports multiple TAS network elements from multiple vendors, including Ericsson, Nokia and BroadSoft. It scales to work with any number of TASs. The solution consists of two applications that work together: a fast, feature-rich desktop client and a powerful server-side admin station. ATAS is effortless to install and set-up. It automatically configures connection details for every required Ericsson, Nokia or BroadSoft TAS, saving valuable engineering time. ATAS Server: The ATAS Server provides indispensable server-side automation. It collects configuration data from Ericsson, Nokia and BroadSoft TASs as well as perform scheduled audits and updates. Data is stored in a fast, always accessible database, which helps to reduce processor loads and network bandwidth for TASs. Data is always instantly available for Clients which saves valuable engineering time. Many tasks can be scheduled to run repeatedly, at any time. ATAS Client: The client provides a responsive and intuitive interface that simplifies and accelerates common or complex tasks. In contrast to many other client-side applications, this solution is optimized to bring you lightning fast access to data. The client can connect to the ATAS server to query data in real-time or engineers can download data for their region and work offline. Scripts can be automatically generated to update TAS configuration. 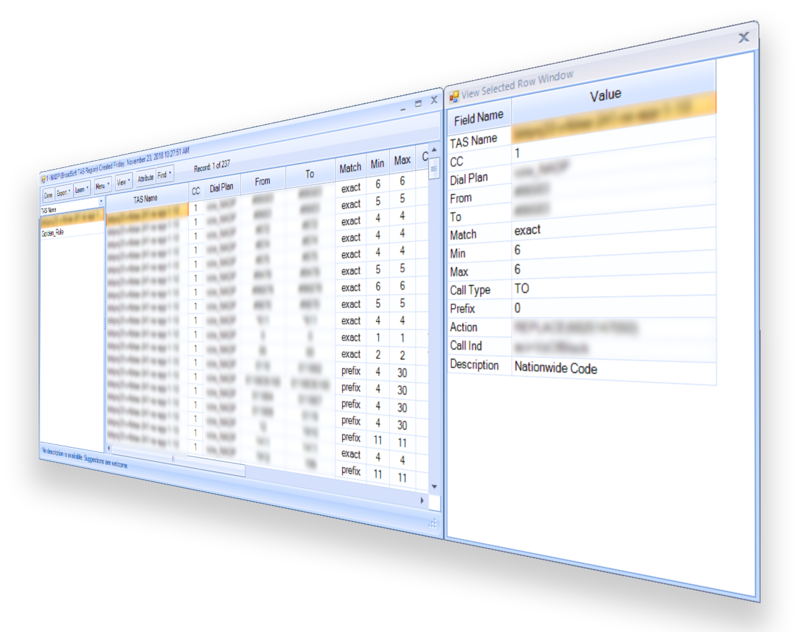 ATAS Reporting: The ATAS server automatically audits production TAS data against a golden configuration. Automatic daily e-mail reports are sent to engineers, detailing configuration discrepancies found in their region. High-level statistics reports can also be sent by e-mail. These include information on the number of discrepancies found by location along with graphs showing improvements or degradations in each region. Separate reports can be sent for discrepancies that have not been corrected for 30 days and 60 days. No installation is required to receive ATAS reports. Configuration Management is at the heart of the Advance TAS Audit System. Configuration data is automatically collected from Ericsson, Nokia and BroadSoft TASs and is always instantly available to engineers without putting any strain on the network. Data can be viewed, queried, audited and even edited with intuitive, time-saving point-and-click controls. ATAS includes a number of features designed to ensure accurate routing using Golden Rules. These features were requested and extensively tested by engineers in the field. The program allows operators to define Golden Rules, a set of reference parameters that can be used to automatically validate the configuration of the TAS network elements that they are responsible for. When the program finds discrepancies between the reference parameters and the actual configuration, corrective scripts can be automatically generated to update the TAS. Configuration data can be easily edited for multiple TASs using a simple spreadsheet style window which is designed to minimize human error. Scripts are automatically generated which can be saved and shared with colleagues to be reviewed or modified before being executed. The ATAS server automatically creates configuration backups and safely stores them on the network. If required, engineers can also make backups on demand. When needed, configuration backups can be automatically or manually restored to roll-back TAS configuration. Manufacturers may be great at making network elements but their configuration software is often cumbersome and difficult to use because there is no financial incentive to improve them. 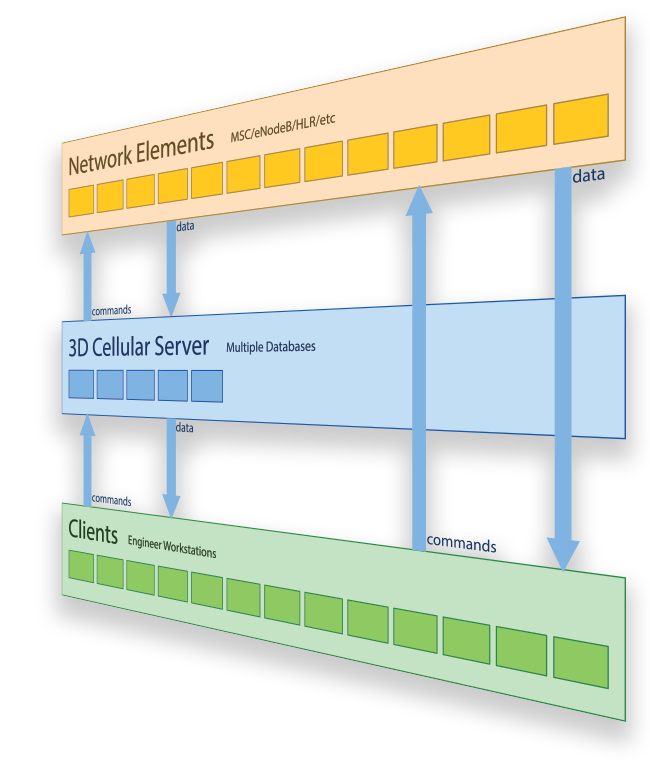 All 3D Cellular solutions share the same easy to learn and user-friendly interface, making it simple to work with multiple network elements from multiple vendors. Complex tasks are reduced to a few clicks and wizards help to accelerate learning with on-screen instructions. 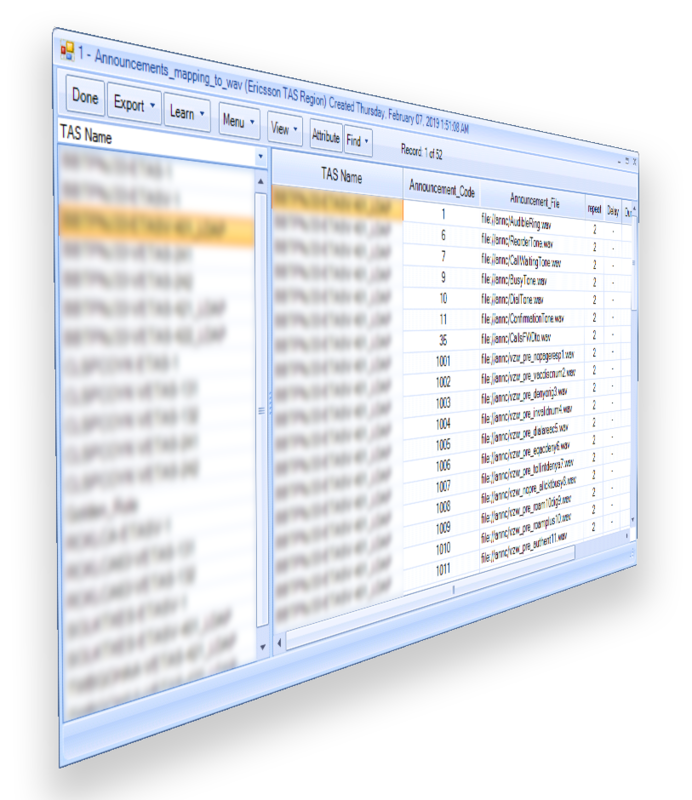 Massive amounts of data can be viewed in a clear and customizable spreadsheet-style view. Intuitive point-and-click query functions allow you to pinpoint and isolate the data you need in record time. 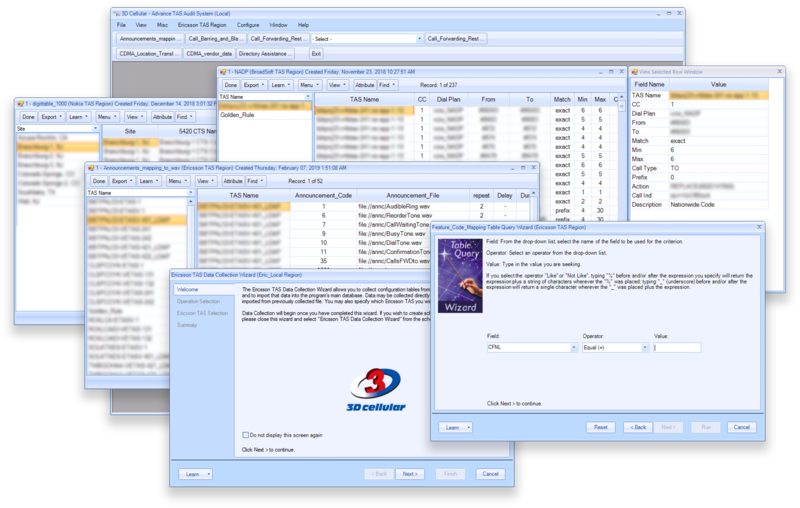 Powerful wizard assisted queries can be saved and used again for any TAS, at any time. With just a few clicks, sophisticated reports can be created and shared with colleagues. Automated Golden Rule Definition: AAllows creation of a highly flexible reference configuration with support for wildcards and complex rules. ATAS automatically scans existing configurations to compile a complete set of Golden Rules for each network element which are then simple to update as needed. Engineers can automatically compare configuration data against golden rules for unparalleled configuration accuracy. Automated Golden Rule Reporting: Automatically receive detailed daily e-mail reports on configuration discrepancies with detailed results for TASs in your area. Automatically Backup and Restore Configuration: Automatically create configuration backup files every day for all your TASs. These can be restored automatically or manually, when needed. Fully Automatic Data Collection: ATAS automatically collects Ericsson, Nokia and BroadSoft TAS data, every day, making it always and instantly accessible to engineers. Scheduled or on-demand data collection can be performed for any number of TAS network elements. Automated Data Comparison: Bulk comparison allows you to automatically compare selected fields in any number of TASs, or even against historical data. Automatically Meet Vendor Software Updates: ATAS automatically detects vendor software updates and instantly re-configures itself to handle any changes. It supports multiple software versions simultaneously.